We are happy to announce the release of SplitView 2008. Many organizations have started to host desktops inside virtual machines running on centralized servers in a data center using VMware Virtual Desktop Infrastructure (VDI). Users can access their virtual desktops remotely from a traditional PC, thin client or re-purposed computer using a remote display protocol such as Microsoft’s Remote Desktop Protocol (RDP). • Manage desktops centrally, simplifying desktop installations, backups and maintenance. Today, we are happy to announce the release of SplitView 2007. Get it here. We have received a LOT of great feedback on SplitView - and this sparkling new release is a direct result of this feedback! After a lot of hard work, and a successful beta, we’re happy to announce the release of SplitView 2.1! SplitView has been very popular lately, and more and more people with bigger and bigger monitors are finding it very useful to work with multiple apps at a time. We have been very buzy in making the next update of SplitView, and this update is ‘pretty huge’ in terms of the features added. 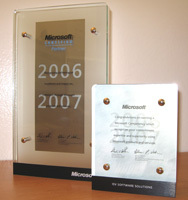 Vyooh has once again achieved the coveted Microsoft Certified Partner status for 2006-2007. In addition to this honor, Vyooh has recieved the Microsoft ISV/Software Solutions Competency.